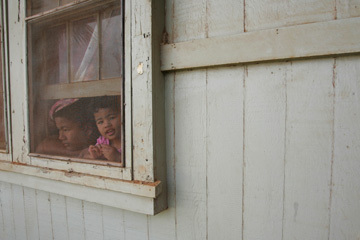 Bryan Crisostomo, 12, and his sister, Princess Leigh, 2, looked out the window of their home yesterday in Kunia Camp, where many Del Monte workers like their father, Ruben, live. The Senate is working to help employees keep their homes. The state Senate Housing Committee is readying a plan to help the Del Monte plantation workers who will lose their jobs and possibly their homes when the plantation shuts down in 2008. Del Monte announced early this month that it would close the 100-year-old pineapple operation, and the 700 unionized workers and an undetermined number of nonunion workers would lose their jobs. Initially, Del Monte said it might transfer the company's employee housing in Kunia Camp to the workers, but nothing has been proposed. Senate President Robert Bunda (D, Kaena-Wahiawa-Pupukea), who represents the Kunia area, said yesterday the Senate is readying two bills, SB 2773 and SB 2774, to address the housing needs of the soon-to-be-displaced workers. The bills would provide a grant program to finance the purchase of the existing plantation homes, mortgage loans at below-market rates, rent supplements, loans to repair or rebuild some plantation homes, and money to help workers with down payments to buy their property. The goal, Bunda said, is to preserve "plantation-style homes in the middle of a pineapple field." Del Monte had been growing pineapple on 3,100 acres of land leased from Campbell Estate. It is not known what Campbell will do with the property. Del Monte leases a total of 5,100 acres from Campbell. "My hope is to keep agriculture alive," Bunda said. "My hope is to not urbanize the land. The ag lands keep open space." The senator said recent inquiries by commercial producers of sugar beets and sorghum have encouraged him to think that the area will continue to be used for crops and will not be turned into housing developments. Two years ago a Del Monte subsidiary closed the only other pineapple plantation camp on Oahu, Poamoho. About 60 families faced eviction until Peter Savio, a developer with Hawaiian Island Homes Ltd., acquired the lease from the landowner, George Galbraith Estate. Bunda said yesterday he is hoping that Savio might be able put together a deal to help Kunia Camp residents, but he was also starting to help with new legislation. The second bill would permit plantation camp housing to continue in land zoned for agriculture. Bunda said that was needed in case the land remains designated as prime agricultural land. Rep. Marcus Oshiro (D, Wahiawa-Poamoho) applauded the bills, saying: "I think they're terrific ideas. The people at Del Monte need all of our assistance. "I believe that we need to help these people who may not only lose their jobs, but lose their homes."